Hardcover; Medical Economics Books; 1990. 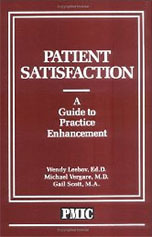 Improve patient satisfaction and your practice will thrive. Concrete tools for creating a medical practice that attracts, pleases and retains patients and their families.